How might we go about reinforcing their favorable behaviors? How might we go about creating other favorable behaviors? Bill Wilson graduates from college and starts his first job. He lives in an apartment, eats fast food, bounces checks, and spends his money on dates and sports cars. Five years later Bill has married Helen and the first child has arrived. They spend their money on baby food, clothes, child care and health insurance. Five years later, their income is getting better, but they have taken on a huge mortgage. They have two cars now: a minivan and a beat up pickup. Give them another five years, and Bill and Helen have started investing in mutual funds for their children’s education. When the children graduate from college, there will be expenses for weddings, and they will be thinking about saving for retirement. By the time they reach retirement age, they will have paid off the mortgage, have some money in their mutual fund account, and have moved into a condo in the city. They drive a Lincoln Town Car. They spend their money on cruises and travel to visit the grand children. This is a typical middle class life cycle. 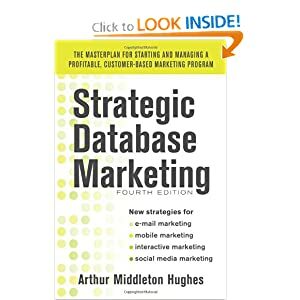 How can we use knowledge of this life cycle to improve our database marketing performance? The auto dealer who sold Bill a couple of sports cars may not anticipate his migration to the minivan. The minivan dealer may not understand when Bill and Helen are ready for the town car. But since car dealers seldom keep track of their customers anyway, missing the migration pattern is typical, and not unexpected..
For Bill and Helen’s bank, however, understanding the migration pattern is essential. When Bill bounced his first check, his bank may have dropped him. What a mistake. They will miss out on all the profitable business ahead. A second bank that gets Bill and Helen in the baby period has to suffer through some lean years. This bank too may get discouraged. But, if they can just hang on, they may get the mortgage, the student loans, and the mutual funds. Today, more and more companies are learning to recognize and make use of the migration patterns in their customers’ behavior. Insurance companies have been doing this for years. They recognized years ago that income and age were the two most important factors in migration. They offered low cost term insurance to young families with children, convertible to whole life policies when their clients reached their peak earning years, again convertible to paid-up policies upon retirement. In my case, about ten years ago, my life insurance agent began selling mutual funds in addition to insurance. He sold me a $200,000 policy when I was 50, which he has now converted to paid-up. Three years ago, he started me on mutual funds, which will finance our retirement. The significance of his technique is that he has kept in touch with me twice a year during the last twenty years, and was able to judge when I was ready for the investment option. Companies that sell only insurance or only mutual funds miss this migration opportunity entirely. Most companies cannot take this long view. They want migration now. Their idea of migration is to start a customer with one product, and advance him rapidly to three or four products. Whether you can do this depends not on age or income, but on other factors, such as share of wallet. If a customer is spending $1,000 with you per year, is that good or bad? It depends on whether the $1,000 is all he has, or is only a small percentage of his spending in your category. To learn that, you have to know more about his total spending. Fedex has developed a unique and useful way to determine which of their customers are ripe for migration. The top 10% are the best and most valuable customers. The strategy is to work to retain them. They invest in services which will protect them against the possibility of defection. The high value growing shippers increased their monetary value by 1,500% over a two year period. They merit serious marketing attention, which pays off. The medium value 6 month lapsed customers experienced a 90% loss in average monetary value over the two year period. What went wrong? Telemarketing research is called for here. It was very rewarding to identify the seasonal low value cluster. These people ship only at certain parts of the year. Spending a lot of money to get them to ship at other periods would be a waste of marketing dollars. What do you do about customers who are migrating down? When Sarah became a national sales exec, she had to fly somewhere every week. She soon became Platinum on American Airlines, flying first class. After ten years, Sarah was promoted to sales manager. Her salary and prestige went up, but she didn’t have to fly as much. American soon dropped her from Platinum to Gold, and eventually took away her premier status altogether. Sarah felt bitter riding on the back of the plane knowing that her employees were swilling it up in first class. She, the one person in the company who has the ability to swing a half a million dollars towards American or United, is treated like a tourist. But that was before American changed their policies. After a customer has accumulated a million miles, they make them Gold for life. This solved Sarah’s problem, and American’s problem as well. This is why it is so important to understand why customers are migrating down. Is it because they have defected to another supplier? Is it a behavior that we can influence and modify? Why do companies give special benefits to senior citizens? Is it out of compassion for the elderly? Perhaps. But most companies realize that, as a group, those over 65 have more disposable income than any other group. They are in a position to travel, to go on cruises, to stay in expensive hotels, to buy in-town penthouses. Their behavior can be modified by proper marketing techniques. They have migrated from being savers to being spenders. If you are starting migration analysis, it is a good idea to create a simple system which ranks customers by spending or lifetime value. In the following familiar chart, we have created five quintiles. In the top quintile are your best customers which probably represent 80% or some similar high percentage of your total revenue. You may want to market to these folks to get them to purchase more, but, on the other hand, that could be just the wrong approach. What these people need is not marketing, but extra super service, service that promotes loyalty. You want to create a feeling of equity in their relationship with you – something that they would lose if they defected. Where your marketing dollars should be directed is towards the second quintile. These people, many of them, have the ability to migrate up to Gold status with just a little more effort. If you can actually segment your customers into spending tiers with recognized boundaries, you can get Bronze customers to work to get Silver benefits. Silver customers will review their spending patterns to achieve Gold. If you want customers to migrate, create achievable status levels that they can work to migrate to. It is really up to you. Decide whether your product or service lends itself to migration analysis. Do you have different products for people in different circumstances? Can you vary your offering? Can you provide suitable rewards that can motivate migration? Study your database to look for purchase patterns, and then to find the reason for these patterns. Once you understand why customers are doing what they do, you can figure out how to modify their behavior. Distinguish which customers have the ability to migrate. Which ones are changing their life style? Which ones have additional share of wallet in your category? Be careful with your top tier. They are vital to your business success. You really don’t want them to migrate, so find ways to keep them where they are. Create intermediate tiers. Let your customers know where they stand. Make the migration achievable. Reward them when they migrate. Anticipate downward migration. Decide what your policies will be, and how to assure that downward migrators don’t leave you altogether.